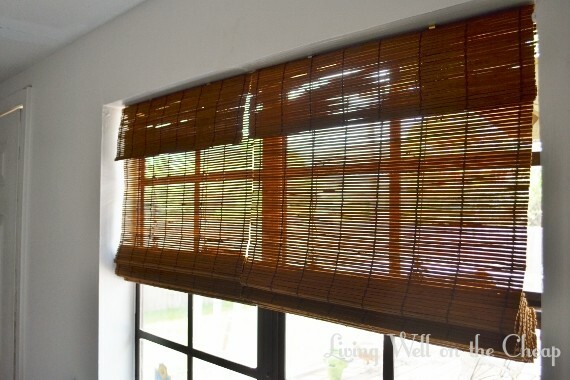 I’ve been talking for months about replacing the broken miniblinds in our laundry room with some bamboo shades. I see them all over the internet in other peoples’ homes and I love the way they look. The problem I kept running into is that these are the only modern-era windows in our house (and by modern era I mean 80′s) and sized a little strangely. 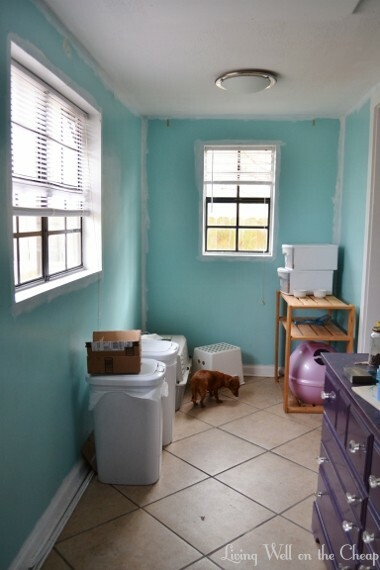 I could find blinds for the small one with no problem, but the larger window is 46.75″ wide and there were just no reasonably priced blinds in that size. 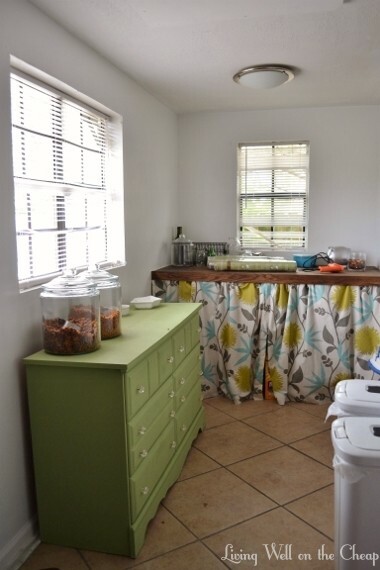 Custom blinds were expensive and using a wider blind wouldn’t work with the inside-mount look I was hoping for. But last week I read a post on another blog about installing these inexpensive shades from Home Depot and it seems I’d found a solution! I ended up installing mine a little differently than they did, but I’m so so happy with the result. 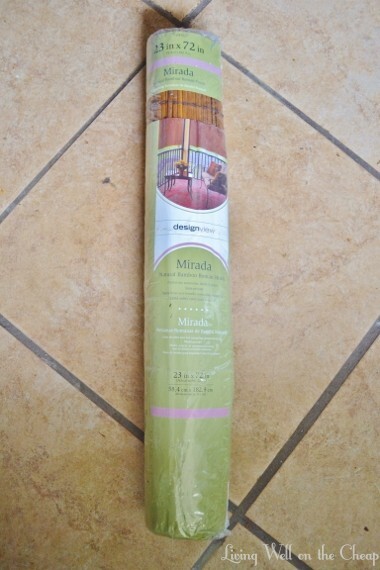 These 23″ wide shades were only $15 each. I’d been warned by the online reviews that they varied in tone quite a bit, so I pulled a bunch out and compared colors until I found three that were a pretty close match. Back home, I took a piece of scrap wood and cut it to 22″. I’m not even sure what it was left over from, but at 1″x2″ it was perfect for this project. I just used a little manual hand saw I bought a long time ago for like $10. You see, the shades came with these little hook things on top, and the idea is that you hang them from the hooks, but I didn’t like that they wouldn’t be mounted flush against the top of the window. 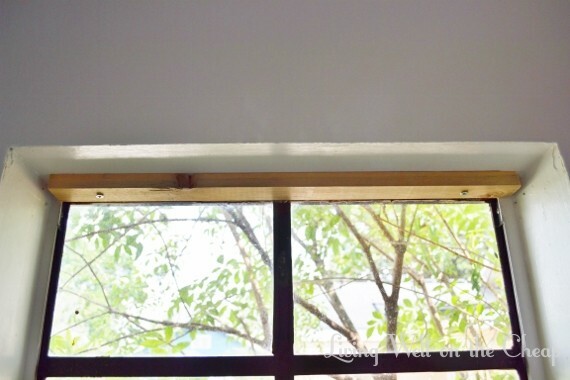 So I screwed my scrap piece of wood to the top of the window frame and then screwed directly through the top of the shade to attach it to the wood. For the bigger window, I just installed two smaller shades side by side. Since I was mounting them to the top of the window instead of the sides it didn’t matter that I couldn’t find one shade to span the whole width. You can see if you look closely the little hooks at the top that I didn’t use. I just folded them back so they’d be out of the way. Ah, so pretty! And sooooo much better than broken miniblinds. 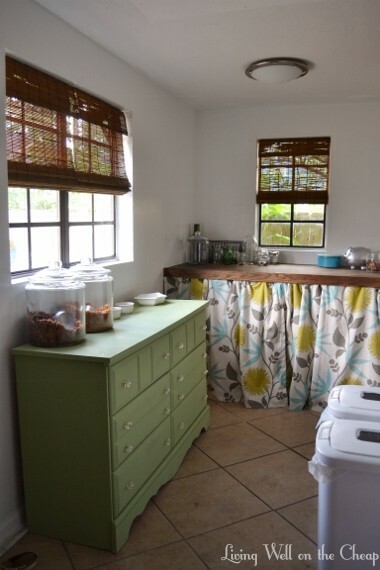 Plus I think shades like these are really the only things appropriate for this room–long curtains are impractical, I’ve got cafe curtains in the adjoining kitchen, and fabric shades would collect lint and dust. These seem pretty low maintenance and perfect for prettifying a casual/utility space. Can you believe that this is what this area looked like as recently as January? You’ve come a long way, baby. 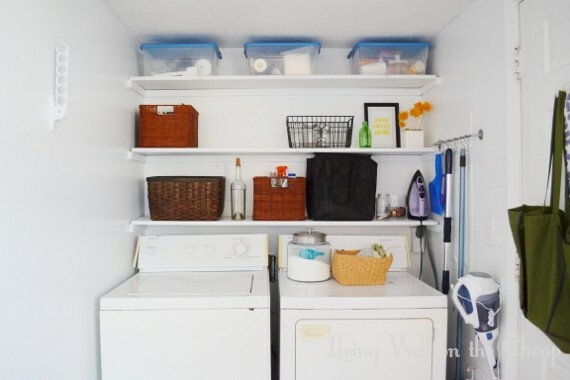 I realize that I keep referring to this as “the laundry room” despite the fact that there is no washer/dryer in sight. That’s because that end of the room still has a long way to go. I was standing directly in front of the washer as I snapped the photos above. The open shelves are not as functional as they used to be and I’m debating lining them with matching baskets/bins (which can be pricey when you need 6-12 of them) or ditching all but the lowest shelf (leaving me with a big empty space completely devoid of function). And of course I’d love to replace the washer and dryer! They’re super old and not in good shape but we’re still saving our pennies. But that’s how all my big projects creep along: little by little as I gather money, inspiration, and motivation, haha.